National Mole Day is observed annually by chemists and chemistry students on October 23. You may be thinking that this day is in honor of the little burrowing creature. However, it is not. This celebration takes place between 6:02 AM and 6:02 PM, making the date 6:02 10/23 in the American style of writing dates. The time and date are derived from Avogadro’s number, which is approximately 6.02×10^23, defining the number of particles (atoms or molecules) in one mole of substance, one of the seven base SI units. A mole is a unit of measurement used in chemistry to express amounts of a chemical substance. Avogadro’s number is a historical term closely related to the Avogadro constant. The Avogadro constant is named after the early 19th-century Italian scientist Amedeo Avogadro. National Mole Day originated in the early 1980s in an article from The Science Teacher. 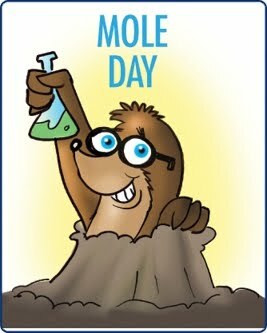 Prairie du Chien, Wisconsin High School chemistry teacher, was inspired by the article and founded the National Mole Day Foundation on May 15, 1991.